Be aware of high terrain to the North, West and South of Airport. Exercise caution for turbulence during windy conditions. Wind socks located at the East, West and midfield of airport. A wind tee is located midfield. Transit parking located at the approach end of runway 6. Overnight parking fee for single engine aircraft $5.00 and $7.00 for twins. Pay envelopes located in kiosk marked overnight aircraft. Parking fees should be put in the pay envelope and placed in slot located in locked pipe next to kiosk. Walk through gate is next to restaurant parking. The month to month tie down fee is $60.00 a month. Airport usage fee is $55.00 a month. If you would like, you can pay your fees in advance. If you pay for 12 months you get the 13th month free. 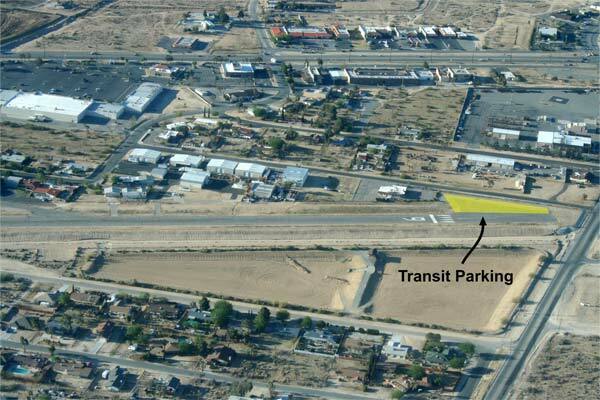 Please call the Yucca Valley Airport information phone number at (760) 953-3670 for tenant contracts.